The universal-fit Safariland radio case features an adjustable band to fit almost any standard portable police radio. The bottom lip retains the radio from falling through the carrier. Rugged Safari-Laminate construction. Fit my agency issue radio without any issue. Does not have the look of an adjustable case. Professional appearance. I'm on bicycle patrol and this case is awesome. 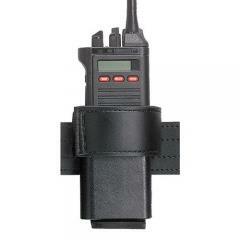 Fits great on both nylon and leather belt and keeps radio in place without moving around. Holds my radio fine, except I took off running after a suspect the other day and my radio popped out since there is no retention device on this holder. It also squeaks a little but is starting to get better over time. Another great product from Safariland. Thanks Safariland and CopsPlus. Holds my radio perfectly. Good quality. Light, great looks, and fits my Motorola APX6000 perfectly. Doesn't hold the radio tight enough. It holds a radio, what else can you say. How does it attach to the duty belt? Will this hold my motorola apx 6000 securely and not swivel? Yes, this will fit your radio. Yes, you can continue to use the radio case as the lapel microphone will not interfere with the usage of the case.